Jonas was born 1 Apr 1663 in Dedham, Mass. His parents were John HOUGHTON and Beatrix WALKER. He married Mary BURBEEN on 15 Feb 1681 in Woburn, Mass. The history of this man is meager, owing to the destruction of the Lancaster town records during the war with the Indians. 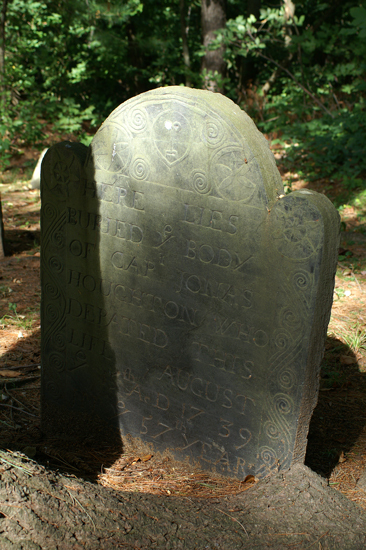 Jonas died 20 Sep 1723 in Lancaster, Mass . 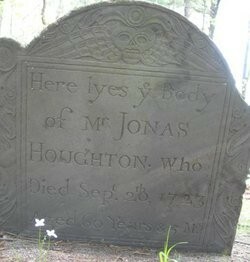 Jonas Houghton Headstone : Here Lyes ye Body of Mr. Jonas Houghton Who died Sept 20 1723, Aged 60 Years & 5 mos. Mary Burbeen was born 2 Jul 1661 in Woburn, Mass. Her parents were John BERBEANEand Sarah GOULD. Mary died 31 Dec 1720 in Lancaster Mass and is buried at Old Common Burial Ground in Lancaster. 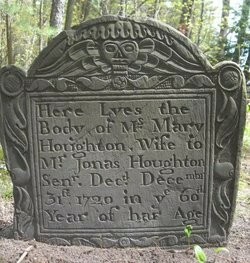 Mary Burbeen Houghton Headstone: Here Lyes the Body of Mrs. Mary Houghton, Wife to Mr. Jonas Houghton, Sen'r. Deceased December 31st 1720 in ye 60th Year of her Age. 7 Jul 1708 Charleston, MA. 17 Jan 1770 Attleborough MA. 1712 25 JUN 1764 Bolton, Mass. At sunrise on February 10, 1676, during King Philip’s War, Lancaster came under attack by Narragansett, Wampanoag, and Nashaway/Nipmuc Indians. Jonas was thirteen and after the massacre, he fled with his family to Charleston. (See John Houghton‘s page for details). Jonas and Mary were married while staying in Woburn, Massachusetts due to Indian hostilities. After his father’s death, he settled on his father’s lands in Bolton, Massachusetts on Vaughan’s Hill. (See Google Map Satellite View) He was a farmer and surveyor. He was in the garrison at Lancaster and was a proprietor of the additional grant. He served in the Queen Anne’s War. He was admitted into the first Church of Christ in Lancaster April 9, 1721. The list of damages in the town due to the the Indian attack on Lancaster in 1704. includes the item: “Jonas Houghton, one ox”. Jonas and his brother John signed a petition requesting that Lancaster be exempt from taxes due to the Indian attack. Jonas is mentioned a few times after that in the records for property descriptions or for fixing property boundary lines. In 1708 he signed the Lancaster Church Covenant; in 1720 he was granted 6 or 7 acres on the top of the southern-most Vans Hill as payment for nine days work in building a bridge; and in 1722 a receipt calls him Constable. 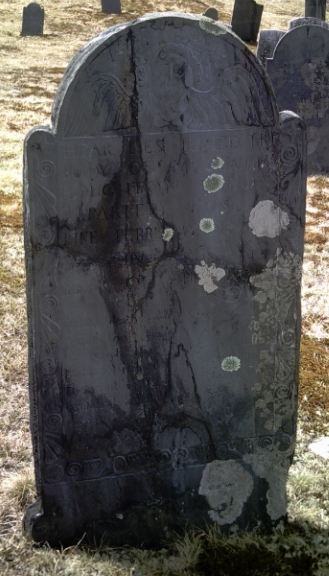 He died in 1723, and is buried in the Old Common Burying Ground. Jonas Houghton Jr. was the oldest son, born in 1682. We know nothing about him until his marriage with Mary Brigham of Marlborough in 1710. They had nine children born in Lancaster including Betty in 1715/16. On March 2, 1718/19 Jonas was chosen to be a Selectman, and later he also served as Moderator and as Treasurer. He was at one point called “the Lancaster surveyor”, and is listed for several surveying tasks, including to reconstruct a road along the north side of Wachusett. The town of Bolton was carved out of Lancaster and incorporated in 1738, and Capt. Jonas Houghton was chosen as one of the five selectmen, along with two of his Houghton relatives. Since the new town clerk was also a Houghton, it is fair to say that the Houghton family controlled the town of Bolton when it incorporated. 159 Golden Run Road is the oldest known of the many farmhouses in the north part of town that once belonged to members of the Houghton family, original settlers of Lancaster. A large tract of land on Golden Run, Harvard, and Bare Hill Roads stretching north into Harvard had been owned by Houghtons since the early days of the town of Lancaster. When petitions were presented to set off new towns in the 1720’s and 1730’s, many of the most active proponents were the farmers in this north part of what ultimately became Bolton. At least four of the five members of the first Bolton Board of Selectmen in 1738 lived in this section of town, and three of them were Houghtons. Bolton’s first Town Clerk, Jacob Houghton, lived nearby in a house long-since demolished, and other Houghtons once ran an inn or tavern at the intersection of Golden Run and Harvard Roads that lasted for generations. The inn, in fact, which looked out over a green where musical entertainments often took place, gave the longtime name of “Fiddler’s Green”, or simply “the Green”, to Golden Run and the east section of Green Roads. In 1760 his son, also named Capt. Jonas Houghton, built a house that is still standing at 96 Green Rd, on the land of his father. This house is on the edge of the southern-most Vaughn’s Hills, and is on land originally owned by JOHN, then JONAS Sr., and Capt. Jonas Jr.
Like many of Bolton’s former farm properties, this one has been drastically reduced in size in the last several years. While the property still covered 63 acres in 1992, the house now sits on less than two acres in an area now completely subdivided, with modern houses standing just to the east and across the road. The land to the rear and west is still wooded. Since 1992 the porch that spanned the main facade has been removed, and vinyl siding installed on some of the exterior. The facade and east ell end, however, are clapboarded. This is one of several eighteenth-century Cape Cod cottages in Bolton. It is a “three-quarter” house, four bays across the facade, and two- and three-bays on the gable ends, reflecting the two-room-deep plan. Two massive chimneys are located just behind the roof ridge. A complex of ells and additions includes a one-story rear ell that extends back from the northeast corner, to the end of which are attached a former shed extending east, and another ell extending west. The windows of the house are small 6-over-6-sash, in flat, unadorned surrounds. The door is a modern steel 6-panel, but a leaded-light transom remains above it. An entry in the rear bay of the east end also has a modern 6-panel door, with a four-light transom retained. The facade of the northeast former shed(s) is fenestrated with two 6-over-6-sash windows, a modern door in an infill wall recessed under a former wagon opening, and a modern multi-light picture window in the east portion of the wall. The large New England barn that formerly stood northeast of the house was knocked down in the hurricane of 1938. Formerly called the Helen Woodbury House, recent research has led to a name change to the Capt. Jonas Houghton House. Capt. Jonas Houghton (1728-1801), believed to have inherited this house from his father, Jonas Houghton, was a Deacon in the Bolton church as well as a farmer and a soldier in the Revolution, and probably also in the French and Indian War. He and his first wife, Rebeckah, were married in about 1753. If Esther Whitcomb’s estimate of a construction date of ca. 1760 is correct, then the senior Jonas Houghton would have built the house several years after his son’s marriage. Capt. Jonas had at least nine children, and like many of Bolton’s eighteenth-century farmers, he left his homestead, not to one of his older sons ( 271 Vaughn Hill Road), but to his younger offspring. Eleazer (1776-1814) and Silas Houghton (b. 1777), children of Capt. Jonas and his second wife, Lucy, who had died in 1794, inherited this property upon their father’s death in 1801. Eleazer soon obtained his brother’s half, as well, and thus owned the whole house and farm until his untimely death in 1814. He had married Rebecca Barrett in 1804, and after he died the homestead was sold for the benefit of their children. It is not known who the purchaser was, but by 1831 the farm was owned by Town Treasurer Paul Whitcomb, (b. 1802). By 1837, however, he had moved to 50 Bare Hill Road (see Form 154). He had two wives, Sophia Nurse (Nourse) of Nourse Road, who died in 1830 at the age of 24, apparently from complications of childbirth, and Mary Mead of Harvard, whom he married the following year. In all, Paul Whitcomb had thirteen children. The next owner may have been James Pierce, (1801-1872), who is shown as the owner in 1857. He and his wife had at least two children, James W. and Martha, who married Charles W. Nourse, whose father, Warren, had grown up on the nearby Nourse farm on Nourse Road. James Pierce’s son, James W. Pierce (1839-1902), apparently took possession of the house after his father’s death. In 1877 he sold part of his property to the town for the site of the new District #5 Schoolhouse, which was built just east of the house, at the corner of Vaughn Hill Road. (That schoolhouse was one of the three that were moved to the town center in the 1890’s when the schools were consolidated). In the fashion of the turn of the century, Mr. Pierce gave the farm a name, “Brookdale Farm.” Everett Rowe purchased the farm a few years after James W. Pierce died. In ye 57th Year of His Age. John’s wife Mehitable Willson was born about 1700 in Lancaster, Worcester, Mass. Her parents were Jeremiah Willson and Hannah Beaman. Mehitable died 24 Jan 1767 in Shrewsbury, Worcester, Mass. 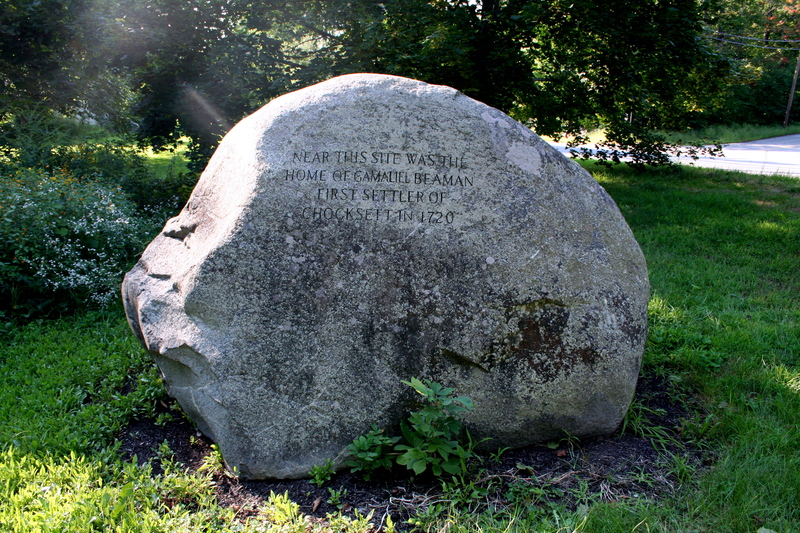 In 1721, Gamaliel was one of the fist settlers of Chocksett, later Sterling, Massachusetts. Sterling was first settled by Europeans in 1720 and was officially incorporated in 1781. After Jonas Stoughton’s death in 1723, Gamaliel and Mary sold her share of her father’s estate to her brother Stephen. He was called “irrepressible” for his persistence in calling for a church there, which was obtained in 1742. Previous to its incorporation it was “the Second Parish of Lancaster,” and was commonly called by a portion of its Indian name, Chocksett. The original Indian name of the area being Woonsechocksett. The land encompassing the Chocksett region was not originally included in the first land sold by the great Indian Chief Sholan to the settlers of the Lancaster grant. However, Sholan’s nephew Tahanto would eventually sell the Chocksett land to inhabitants of Lancaster in 1713. Site of Gamaliel Beaman Home Princeton, Mass. The first white settlers arrived in Chocksett seven years later in 1720, formerly inhabitants of Lancaster proper. Among these first settlers were families such as Beman, Sawyer, Houghton, and Osgood; names reflected to this day in the names of Sterling’s oldest roads. 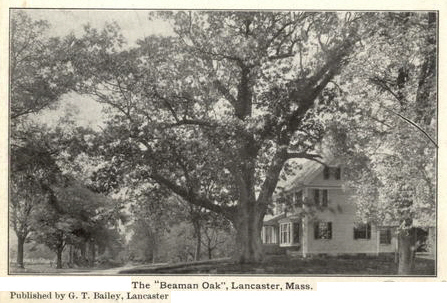 The Beaman Oak was the largest white oak tree in the Commonwealth of Massachusetts, standing in the front yard of a colonial era three-story house in the town of Lancaster. It was so named because Gamaliel Beaman had originally settled the spot in 1659. As of 1970, the Beaman Oak had a circumference at its base of 31 feet, a circumference five feet above the base of 19 feet, a height of 75 feet, and a spread of 75 feet. The Beaman Oak, whose huge trunk was already partially hollow, was cut down after severe storm damage in 1989..
A short time after settlement, in 1733, the residents of the Chocksett area requested its own incorporation, separate from Lancaster, due to the “great inconvenience” of a long distance to the church in Lancaster’s center. This request was denied. However, by 1780 the population of Chocksett was so numerous as to constitute a majority, and so the voters of the area voted out the existing Lancaster town officers and began to conduct town business and meetings in Chocksett. This was enough to convince the rest of Lancaster that it was now time for Chocksett, the Second Parish of Lancaster, to go its own way. Gamaliel Beaman was the first person to be buried in Sterling Centre. 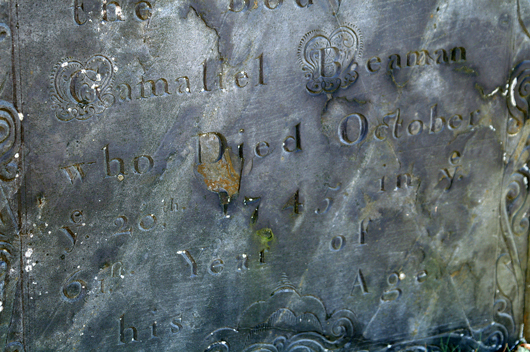 Here Lies buried the Body of Mr. Gamaliel Beaman who died October 26th, 1745; in ye 61st Year of his Age. In 1781, Chocksett was incorporated as its own town: Sterling. The town derives its name from General William “Lord Stirling” Alexander, a Scottish expatriate, who served valiantly under Gen. George Washington in the New York and other campaigns. His portrait hangs in the town hall, and the town commemorated Alexander with a medallion during its bicentennial celebration in 1976. Benjamin’s wife Zerviah Moore was born 1700 in Bolton, Worcester, Mass. Her parents were John Moore and Hannah Sawyer. Zerviah died in 28 Feb 1764 – Sterling, Worcester, Mass. Life February ye 28, 1764 in Ye 74th Year of His Age. To God that judgeth all, Both Wicked and the just. “Second Precinct of Lancaster,” or “Chocksett” as the Town was called before incorporation in 1781. It lies between Clinton Road (route 62) and Maple Street, almost in the center of the Town. The first five settlers to Chocksett in 1720 are buried here: Gamaliel Beaman; Benjamin Houghton; Samuel Sawyer; the brothers David and Jonathan Osgood, as well as many of their descendants; and Colonel Asa Whitcomb, a Revolutionary War leader. Sadly, many of the graves are for very young children, often more than one of the same family, who died during epidemics which took many lives in the 1700’s. Daniel’s wife Lydia Bruce was born in 1694 or 13 OCT 1702 Framingham, Mass. Her parents were John Bruce and Elizabeth Furbush. Lydia died 22 Oct 1752 – Lancaster, Worcester, Mass. Josiah’s first wife Mehitable Warner was born 1699 in Lancaster, Worcester, Mass. Her parents were John Warner and Sarah [__?__]. Mehitable died in 1725. Josiah’s second wife Grace Whitney was born in 1709. Grace died 6 Jun 1763. Ruth’s husband Richard Wilds was born about 1697 in Lancaster, Mass. Dorcas’ husband Ebenzer Polley was born 20 Oct 1693 in Woburn, Middlesex, Massachusetts. His parents were George Polley and Mary Knight. His grandparents were our ancestors George POLLEY and Elizabeth WINN. Although Lancaster had been incorporated originally on 18 May 1653, it was practically destroyed during King Philip’s War (1675-76) and virtually abandoned for a number of years. Negotiations with the Indians resulted in a new deed of purchase in 1701. Resettlement got underway over the ensuing decade, with town meetings, etc. being recorded as early as 1711 indicating a viable community was developing. In 1725 a number of Lancaster residents ventured a few miles farther north and began to build houses in what is now the town of Leominster. One of those settlers of Leominster is documented as Ebenezer Polley. Leominster was formally incorporated on 23 June 1740. At the first town meeting in the newly created town of Leominster, on 9 July 1740, N.S., Ebenezer Polley was chosen as one of the Assessors and was also selected as one of the deer reeves. At the second town meeting, Ebenezer Polley was chosen to be the moderator. The major item of business at this particular meeting was the vote to build a bridge (The Great Bridge) across the Nashua River. This second meeting occurred on 1 September 1740 at the home of one Benjamin Whitcomb. Edward Smith, a minor and bound apprentice to Ebenezer Polley, both of Lancaster, was accused of stealing from his master in the night time. He confessed his guilt, but as Polley had reclaimed all the stolen property except the value of 3 pounds, 3 shillings, he insisted only on restitution to that amount. Smith was sentenced to pay the King £3 or be whipped ten stripes, and pay costs and fees, 5 pounds, 5 shillings, 6 pence. Moreover he was to pay his master 9 pounds, 9 shillings, or triple the loss. Being unable to pay, but “humblly desiring of his master to pay the same”, it was ordered that he should serve his master two years after coming of age, or his heirs or assigns. Polley was, besides his board, to find him in needful clothes. i. Joseph Polly b. 3 Sep 1728 in Lancaster, Worcester, Massachusetts; d. 28 Feb 1806, in Fitchburg, Worcester, Massachusetts. ; m. Dorcas Coburn 1 Mar 1748, in Leominster, Worcester County, Massachusetts. Joseph Polley moved with his family to a newly developing part of town in 1733. This section was to be eventually incorporated as the town of Leominster on 23 June 1740 It was here in Leominster that Joseph married Dorcas Colburn on 1 March 1748/49 and raised a family of at least eight children between 1749 and 1766. A muster Roll of a foot Company, commanded by Thomas Wilder, of Leominster, detached out of Col. Oliver Wilder’s regiment, that marched on the Alarm for the relief of Fort William Henry as far as Springfield. Gone 14 days. Captain Thomas Wilder, Lieutenant Samuel Nourse, Ensign Josiah Bayley,Sergeant Nathaniel Page, …, Joseph Polley, (et al). Sworn to at Worcester, January 8th, 1758 by then Capt. Thomas Wilder. It is interesting to note that Joseph Polley is listed in the Index of Revolutionary War Patriots published by the Daughters of the American Revolution (D.A.R.) on p. 539. He is shown as a fifer from Massachusetts. On examination of the actual application, it was noted that the statement of the patriot’s military activity in support of the Revolution was a verbatim copy of the above quote regarding the march of Wilder’s Company to Fort William Henry, an action clearly in support of the French and Indian War. However, on examination of actual Revolutionary War records in the name of Joseph Polley, one finds that there are two short, overlapping periods of time when Joseph Polley was either in two places at once or there were two different Joseph Polleys. Since the former case is not reasonable, if the records are accurate, one must conclude the latter case is fact. The most likely men are Joseph Polley and his second son Joseph. Joseph’s sons Ebenezer and John served during the Revolution as well. The date, place and circumstances of Joseph’s death are not well documented. The war records for Joseph and his son Joseph, taken in conjunction with those for Ebenezer and John, suggest that the senior Polley died in early 1776. The D.A.R. application based on Joseph Polley, Sr., states that he died in 1776 at “Number 4 New H.” A town history from Gilsum, New Hampshire, speaking about Jacob Polley, son of Peter Polley and grandson of Joseph, Sr., states, “His father [referring to Peter] died in Charlestown No. 4 of wounds received from the Indians.” No date is given. Charlestown is in Sullivan County, NH, close to Acworth, where Peter is supposed to have moved in 1816. It is unlikely that the death of Joseph, Sr. resulted from the French and Indian War. With respect to the Fort William Henry episode, although it fell to Montcalm (9 August 1757) and many were massacred by the Indian allies of the French, the foot company from Leominster all returned according to testimony of the former captain, Thomas Wilder. (This is recorded in D.H. Hurd’s History of Worcester Co., 1889, pp. 1236-1237.) It is known that certain Indians fought for the British during the Revolution, although the Gilsum history in no way implies that the death of Joseph, Sr. was in any way related to the Revolution. The fact that Joseph Polley, Sr. is said to have died in New Hampshire has given rise to a misstatement of the facts concerning his Revolutionary War service since there was another Joseph Polley who did indeed fight in New Hampshire. The misstatement is recorded in the 3 February 1944 issue of the Watertown (NY) Daily Times, p. 12, in a story regarding the death of Charles Sheldon Polley, a great-great-grandson of Joseph, Sr. The badly written story, besides citing the wrong father for Charles Sheldon, describes certain New Hampshire service for Joseph, Sr., giving as the patriot’s date of birth the birth date of his son, Joseph, Jr., instead. The dates of service and the cited officers are identical to those cited in Widow’s Pension file W4759, BLWT 3758-160-55. This particular Joseph Polley was first married to a Mary Johnson and then to a Rebecca (Canfield) Crawford. He died at Bridgeport, CT on 11 July 1843 at age 88. Clearly this was not Joseph Polley, the father of John, Joseph, Ebenezer, Peter, Elnathan, et al. Rockingham County, Windham, April 1777. We the subscribers do acknowledge to have recd of the selectmen thirty pounds each as a bounty from this town for three years service in the Contl Army for the term of three years. These certify the selectmen of Windham gave a note for thirty pounds to the within Joseph Polly for his enlisting in the Contl Army and that they paid the note to me. The Joseph Polley whose service is cited above and who is often confused with Joseph Polley, Sr. of Fitchburg, MA, is believed to be the son of John Polley and Jemima Nichols, born 20 August 1756, in Medford, MA. It would appear that the previously cited D.A.R. application, dated 28 Mar 1910, got its information about Charlestown No. 4 from the “History of Gilsum, New Hampshire,” published in 1881, and both are erroneous with regard to the place and circumstances of the death of Joseph Polley, Sr. The Index to Worcester, MA wills for 12 Jul 1731 to 1 Jul 1888 (LDS microfilm No. 0850169) indicates a will being probated for a Joseph Polley in Fitchburg, MA in 1777 (Item #47266) and another being probated in Fitchburg in 1806 (Item #47267). These are most likely the wills of Joseph, Sr. and his son Joseph. Worcester Probate Records, Series A, Vol 39, 1809-1811 (LDS microfilm No. 0856321), shed additional light on the demise of both Josephs. At pages 229 and 310 respectively, one finds the dower for Dorcas and Eunice Polley (widows of Joseph, Sr. and Joseph, Jr.) being set off and documented by a court appointed commission. The first is done for Dorcas, at the behest of Eunice. It is signed off as approved on 20 Sep 1810 by the guardian to Dorcas Polley, William Kendall. Then immediately after, during October 1810, the dower for Eunice is set off and documented. Both documents cite wills for the two Joseph Polleys. A third action on the last cited microfilm, from Worcester Probate Records, Series A, Vol 38, 1809-1811, on page 503, is the inventory of the estate of Dorcas Polley dated 12 October 1810. The three documents paint a picture that the lands of the two Josephs were continually occupied following their respective deaths by their widows and whoever they had working the land. Dorcas had apparently taken ill, gone feeble or was in some way incapacitated, requiring a guardian. The estates of the two Josephs apparently had not yet been settled, at least not totally. Eunice probably realized she would save a lot of legal trouble if she settled the estates before Dorcas died. It appears she accomplished her task in the nick of time! 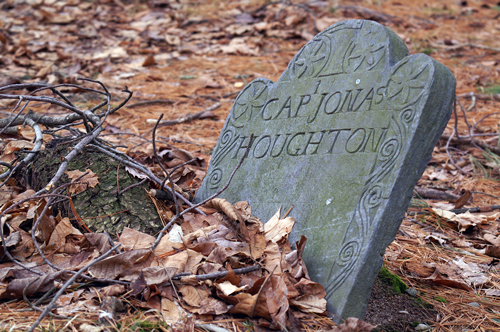 The fact that Dorcas appears to have died in 1810 casts doubt on the Fitchburg town record, p.303, that says she died in 1812. However, it would not be the first time a town record was mis-transcribed. The foregoing discussion also fixes an initial time when Eunice Polley may have gone off to Massena, NY, sometime after 1810. A widow, having sold off her land, going off to live with one of her children, is a very plausible scenario. This entry was posted in 11th Generation, Be Fruitful and Multiply, Historical Monument, Line - Shaw, Pioneer, Veteran and tagged Bolton Pioneer. Bookmark the permalink.